Several years ago, at a time when there was a lot of discussion, on this blog and elsewhere, of different views of the atonement, Norman McIlwain kindly sent me a free copy of his book The Biblical Revelation of the Cross. Norman, like me, was critical of the doctrine of penal substitutionary atonement, and was looking at other ways of understanding the biblical material about the death of Jesus. I intended to read the book and review it here, but to my regret I never did so. Norman has now revised and expanded his book and published it again, but for now only online, and free of charge. The extra material is about the early church’s teaching on the atonement. This is not formatted as an e-book but as one long HTML page, here: The Biblical Revelation of the Cross. See also Norman’s main Bible study website. Our atonement, therefore, is achieved for us through our being raised up in Christ, who gave Himself for us that we might know God through Him and the power of the resurrection. This is surely a book worth looking at for anyone interested in the atonement. 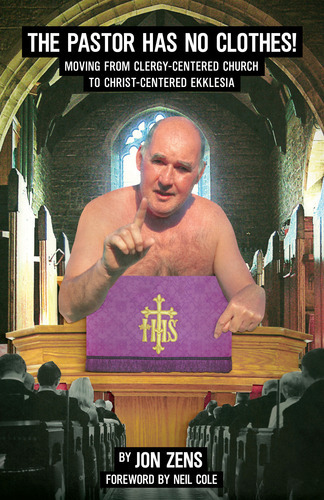 The Pastor Has No Clothes! Protestantism carries on with the practice of making the “pastor” the focal point in church. In The Pastor Has No Clothes, Jon Zens demonstrates that putting all the ecclesiastical eggs in the pastor’s basket has no precedent in the New Testament. So do what I say, but have not yet done: buy the book and read it! Joel has been sent a review copy of R.C. 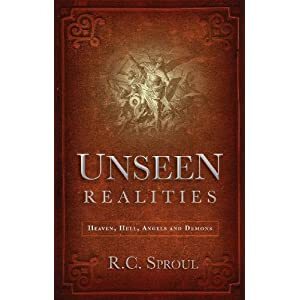 Sproul’s recent book Unseen Realities: Heaven, Hell, Angels and Demons , and he has commented on it without yet reading very much of it. Scott apparently hasn’t even seen the book, but that hasn’t stopped him not only commenting on its title and product description but also setting up Sproul for a battle with Bultmann. All this reminds me of another recent book which was widely condemned by people who hadn’t read it. I haven’t read Sproul’s book either, so I will make no comment on it. But I would like to comment on the half-baked philosophical objections to what they think Sproul is saying which Joel hints at and Scott makes explicit. Of course it may well be that Sproul has answered these points in his book, and if so probably far better than I can. It is impossible to use electric light and the wireless and to avail ourselves of modern medical and surgical discoveries, and at the same time believe in the New Testament world of daemons and spirits. How 19th century! This sounds like the understanding of science which the young Bultmann would have learned in around 1900 at his Gymnasium in Oldenburg, Germany, when electric light and “wireless” were the latest cutting edge technology. This was the era when physicists were confident that within a few years they would be able to explain everything in the universe in a purely materialistic way, according to rigid and deterministic laws of nature. This is what is now known as classical physics. Within the next five years that scientific optimism had been swept away by new discoveries. It became clear that radioactivity, discovered in 1896, could not be explained by classical physics. Planck’s 1901 paper on black body radiation laid the foundations of quantum physics. Einstein’s four “Annus Mirabilis” papers of 1905 clarified the reality of quanta and introduced special relativity, destroying the Newtonian framework of classical physics and showing that matter and energy are equivalent. And Russell’s paradox, discovered in 1901, demonstrated the weakness of the mathematical foundation of classical physics. But Bultmann would have followed little of this, or of the revolution in physics which it led to, because by now he was studying theology. So, as his 1941 lecture demonstrates, his understanding of science remained stuck in the 19th century. Sadly many theologians of the later 20th century also ignored contemporary science and preferred to accept Bultmann and his contemporaries as authorities on these matters. But this gives no excuse for us who live in the 21st century, who have now had more than a century to reflect on the scientific revolution of 1901 to 1905. It has long been known that quantum physics implies that the universe is not deterministic in the way assumed in the 19th century. The Free Will Theorem, which I wrote about yesterday, suggests that randomness is not the best way to describe even the behaviour of sub-atomic particles. Eric McLellan, whose post I linked to, shows how this leaves room for God and for the human mind to work within the laws of nature. By the same argument, there is room for angels and demons to work in our universe. It is also worth noting how far Bultmann’s position depends on a perspective from the intellectual elite in the West. In other cultures, and even within popular western culture, there has always been room for the “supernatural”. It is no longer possible, as it was in Bultmann’s time, to reject non-western beliefs as primitive and so not worthy of serious attention. we may not be able to materially test metaphysical or supernatural entities such as demons, but if they have any tangible effect in the real world then those could be subjected to real world examinations. In other words, while hypothetically the testing of the cause is impossible, the testing of the proposed effect of any supernatural being in the real world is entirely possible. The problem with applying tests of this kind is that we are (at least as the hypothesis) dealing with sentient beings who are under no obligation to cooperate with us. Just as experiments on the behaviour of individual humans cannot succeed without their consent, so we cannot hope to experiment on the behaviour of individual demons or angels who are unlikely to consent. The best we can do is observe their typical behaviour using the kinds of techniques used in anthropology. And that is likely to be unpredictable, especially when they are being observed, just as with humans. In quantum physics, even sub-atomic particles behave differently when they are being observed! Nevertheless there is a significant body of reports of the activities of angels and demons in our world. But scholars refuse to take these reports seriously because they cannot be reproduced in a laboratory. If they applied the same standards to astronomical observations, often of unique occurrences, then we would be allowed to know a lot less about our universe than we are supposed to know. There is an uncompromised supernaturalism at the heart of the Christian worldview, and we must not let the world’s skepticism with regard to these things affect our belief systems. We must trust and affirm that there is much more to reality than meets the eye. Review: What's with Paul and Women? Jon Zens kindly sent me for review a copy of his book What’s With Paul & Women? Unlocking the Cultural Background to 1 Tim 2 (Ekklesia Press, 2010). Zens starts his book with a quotation dated 1709 from a vicar of Dedham in Essex, UK, teaching (in fact quoting KJV) that women should learn in silence. So it is fitting that I write from Essex to examine Zens’ argument against that position as traditionally understood. The book is a brief one – barely 60 pages of large print in its eleven chapters, and another 40 or so (of pages without numbers!) in three appendices (which I have not yet read). It is largely concerned with just two verses in the Bible, 1 Timothy 2:11-12. In chapter 3 Zens discusses the background to his passage in 1 Timothy 2. He notes how the same Greek word hesuchia is used in verse 2 as well as in verses 11 and 12 and so cannot mean “silence”. (Actually in verse 2 the Greek word is the adjective hesuchios, but the underlying meaning is surely the same.) Thus Zens sees the thrust of the chapter as teaching to avoid the kind of disorder that was common in Ephesus. In chapter 4 Zens brings in the cultural background of Ephesus, with the strong influence of the Temple of Artemis. He claims that the women of Ephesus sought favour from Artemis “by donning and presenting expensive attire and ornate hair” (p.40, quoting Frank Ames). He sees Paul’s instructions to Timothy in verse 9 as in deliberate contrast. In chapter 5 Zens shows in more detail that hesuchia in 2:11,12 does not mean silence, despite the KJV rendering. It is somewhat ironic that he quotes Leland Ryken in support of his point that some people wrongly assume that their preferred Bible translation is “completely accurate and trustworthy”. Zens then looks at the word “submission” in 2:11, and notes that this is not a requirement only for women, as elsewhere in the New Testament all Christians are taught to submit to one another. Then he notes that women are told to learn – a surprising point in the cultural context. Unfortunately he compromises his logical argument in this chapter by twice digressing into polemics. Zens suggests that Paul’s words about men as the “head” were misunderstood in terms of the mind-body dualism of classical Greek philosophy. Thus he distinguishes the apostle’s teaching from that of the church fathers, and indeed from that of much of the church through the ages up to today. This of course completely undermines the understanding of 2:12 as teaching that women must not be in such positions of authority. In chapter 8 Zens moves on to verse 13 of 1 Timothy 2, and sees Paul’s teaching that Adam came first as polemic against the teaching of the Artemis cult that the female came first. In chapter 9 Zens discusses verse 14 and notes close parallels with Revelation 2:20-24, suggesting that this verse is Paul’s teaching against a specific woman false teacher. In chapter 10 Zens attempts to meet the objection that he is not upholding this passage as “timeless gospel truth”. He points out that all the New Testament letters are in response to specific local issues, and that they all have to be interpreted in the light of their cultural contexts. The book comes across as based on a clear but not very detailed exegetical discussion of the verses, based on a variety of sources. This was then expanded to be thick enough for a kind of book by adding some extraneous polemics, and matter from church history, also the appendices. Although the subtitle is “Unlocking the Cultural Background…” this background is in fact only a minor theme. The arguments made in this book and good and thorough for a popular presentation, although not rigorous enough to convince scholars. I also doubt if it would convince those initially opposed to Zens’ conclusions, not least because the polemics in chapter 5 would alienate them. But this book will be helpful to those who are unsure of their own opinions, and for those who tend to share Zens’ position but want good material to back it up in argument with others. I don’t think I would go quite as far as Zens in using the provocative words “false teaching”. But he is right to conclude that this passage in 1 Timothy cannot properly be used to stop otherwise well qualified people from active service in the church just because they are women.